Cocktail dresses from the Sue Ann Genet Costume Collection in the College of Visual and Performing Arts (VPA), as well as the work of junior fashion design students in VPA’s Department of Design, will be featured in the historic costume exhibition “Fashion After Five: The Clothes and Culture of the Cocktail Hour” at the Onondaga Historical Association (OHA), 321 Montgomery St., Syracuse. “Fashion After Five” will have a special opening reception, which includes a fashion show of student work and the debut of the OHA Speakeasy, on Wednesday, Nov. 13, from 5-9 p.m. Admission is $15 for the public; tickets will be available at the door. Admission is free for SU students with a valid SU I.D. The exhibition will be on view to the public Nov. 15-June 15 and is free. Twenty-two garments from both the Genet Costume Collection and OHA are displayed in vignettes showcasing each 10-year era. The students designed eight additional looks specifically for the show. “Fashion After Five” also highlights major local industry and businesses, including Syracuse China, Smith Corona, Hueber-Breuer Construction and Lisa Limited. Onondaga Historical Museum hours are Wednesday-Friday, 10 a.m.-4 p.m., and Saturday-Sunday, 11 a.m.– 4 p.m. For more information, visit http://www.cnyhistory.org. The OHA exists to inspire people’s understanding that the history we share as a community is the foundation for our future together. Its purpose is to educate and encourage the exploration, appreciation and utilization of the past in order to add value throughout the community and bring the great stories of Onondaga County’s history to a worldwide audience. Established in the 1930s, Syracuse University’s historic clothing collection, now known as the Sue Ann Genet Costume Collection, is comprised of more than 3,500 women’s garments and accessories from 1820 to the present. 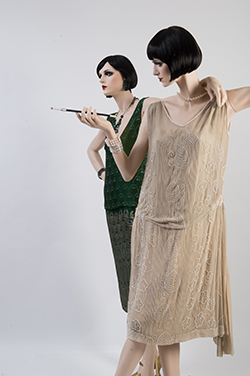 Used for exhibition, research and as classroom examples, the collection focuses on women’s high fashion and includes examples of garments that are indicative of each era, are by well-known designers or were worn by prominent women. Notable groupings include an impressive holding of the American Progressive Era (1890-1920) as well as large individual groupings of designs by 20th-century designers, including Geoffrey Beene, Bill Blass, Mary McFadden, Adele Simpson, Bonnie Cashin and Emilio Pucci.